Spring Azures spent the winter as pupa, cozy in their chrysalises, poised to take the final step to adulthood when spring conditions were right, with longer days and warmer temperatures. 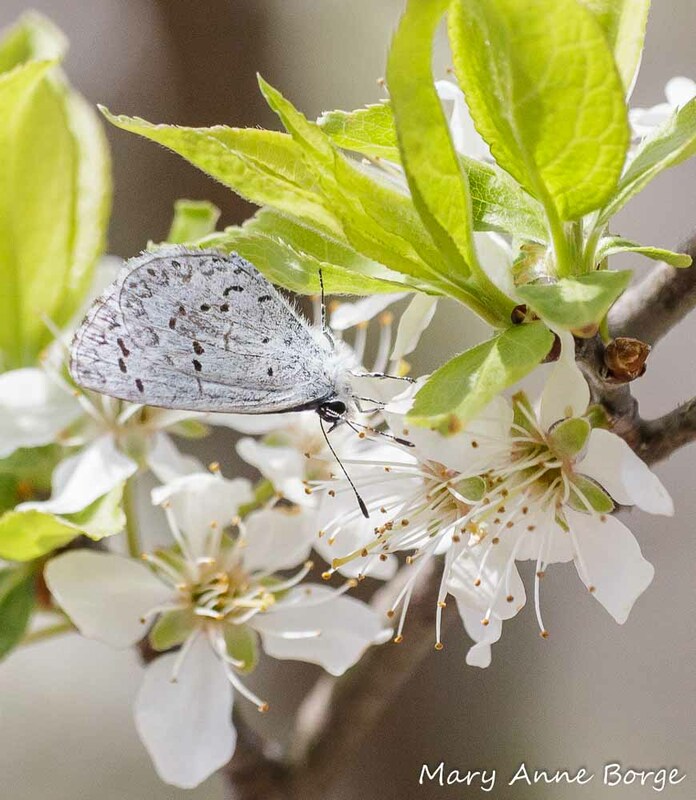 Their fluttering flight showing flashes of azure began lighting up woodlands and gardens earlier than usual this year, when unseasonably warm March temperatures encouraged them to complete their metamorphosis and emerge as early as the last week of March. Nectar was scarce in those early days of emergence, especially when weather whiplash sent the temperatures in the opposite direction, dropping below normal. During the lean times, Spring Azures got their nourishment from a variety of mineral sources, including mud puddles, rocks, leaves, and even bird droppings. As temperatures soared again, nectar supplies became plentiful. Now their priority is reproduction – making sure their species has a future. 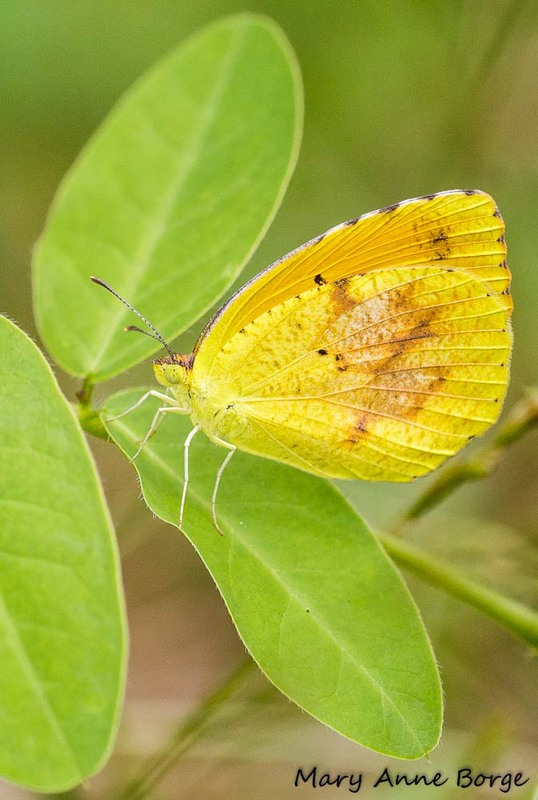 After mating, female Spring Azures look for plants appropriate for egg-laying, plants whose leaves their caterpillars can eat and on which they will thrive. 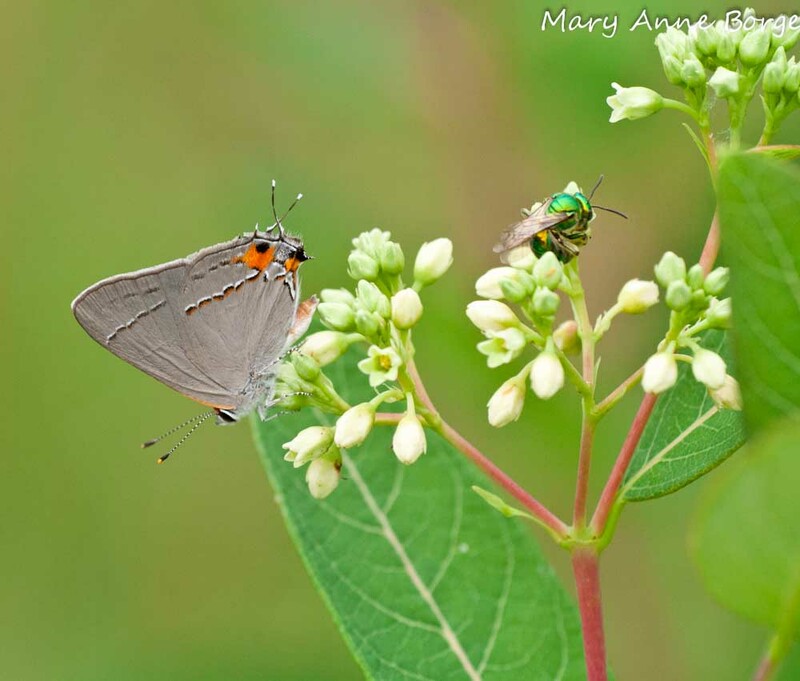 Spring Azures evolved to use the newly emerging leaves, flowers and buds of a variety of woody plants as their caterpillars’ food, including viburnums, dogwoods (Cornus species), and New Jersey Tea (Ceanothus americanus). 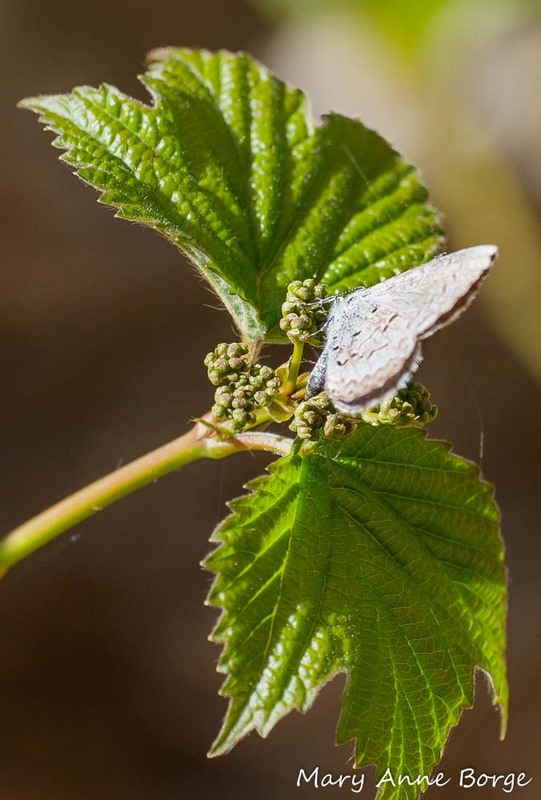 For the past week, I’ve watched Spring Azures flitting from plant to plant, and from leaf to bud of Maple-leaf Viburnum (Viburnum acerifolium), taking only seconds to lay each egg. The eggs will hatch and caterpillars will emerge, nibbling on the newly developing leaves and buds. Not all of the caterpillars will complete metamorphosis to fly as butterflies, however. Caterpillars are very vulnerable to predators, including other insects, spiders and birds. Caterpillars are an essential source of food for birds, especially when they are feeding their young. It may take thousands of caterpillars to feed a hungry clutch of growing birds. Normally, ants would be among the insects that would love to eat a tasty caterpillar treat. Even when fully grown Azure caterpillars are small, the perfect snack size for an industrious ant on the hunt. 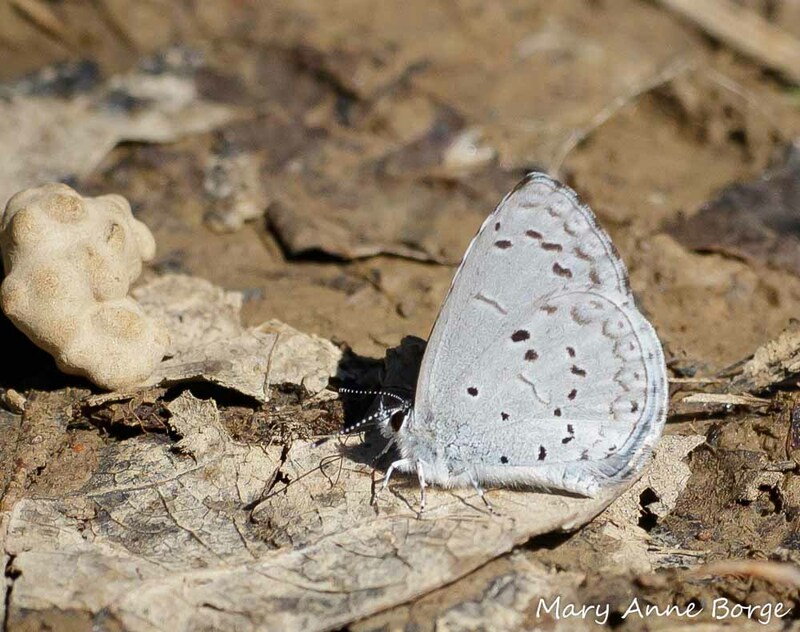 To protect themselves, Azure butterflies have developed a way to enlist the ants to protect them rather than eat them. Azures produce delicious honeydew that ants love. The ants guard the Azure caterpillars, palpating them to trigger the honeydew payment. 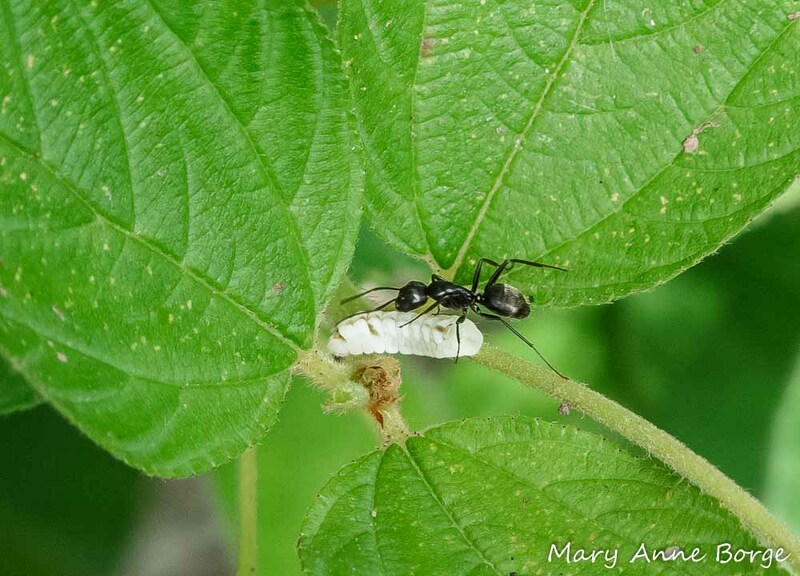 Ant guarding/palpating an Azure caterpillar for honeydew. They’re on New Jersey Tea (Ceanothus americanus). 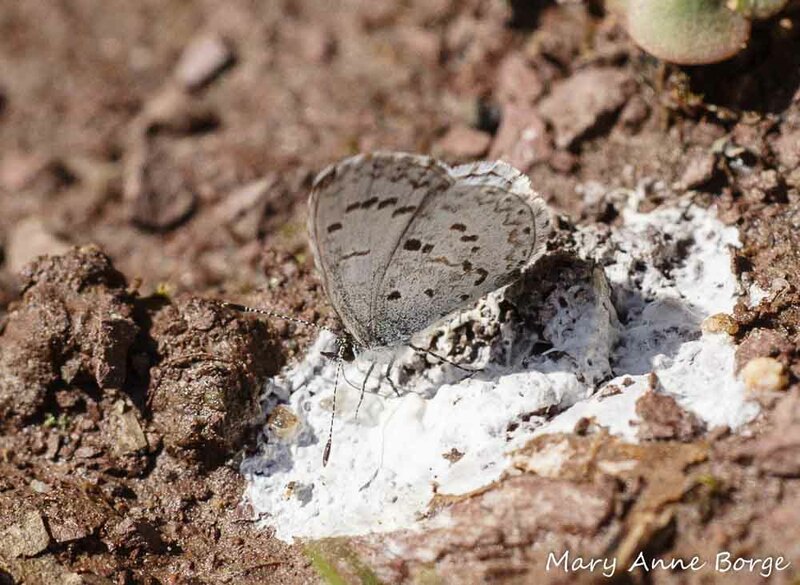 Ants will work for the highest bidder, and in this case they help some of those caterpillars live to become butterflies. 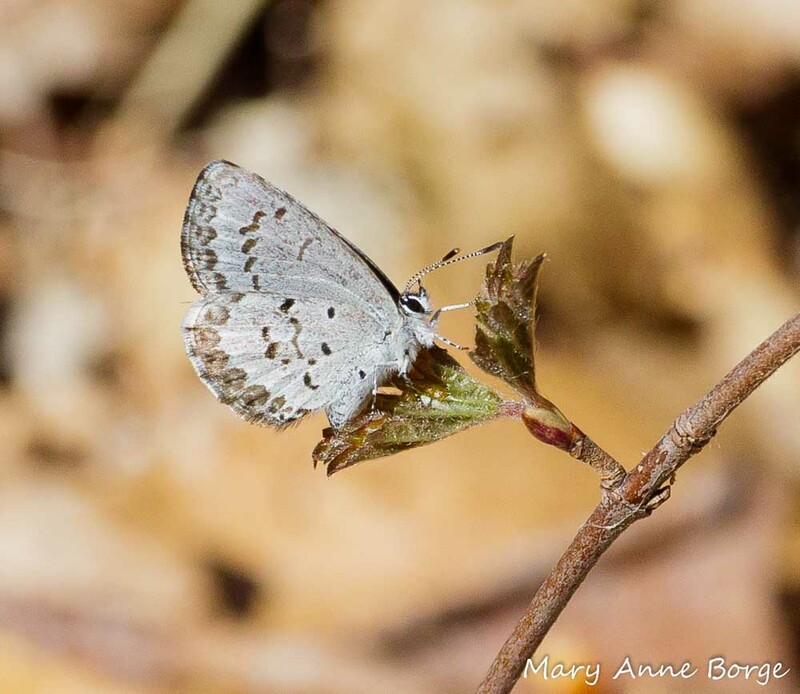 We often think of butterflies as relying on nectar from flowers as their primary source of food for adult butterflies, and many species do. But there are others who feed mainly on minerals, often from mud or dung, or who consume both nectar and mineral sources. 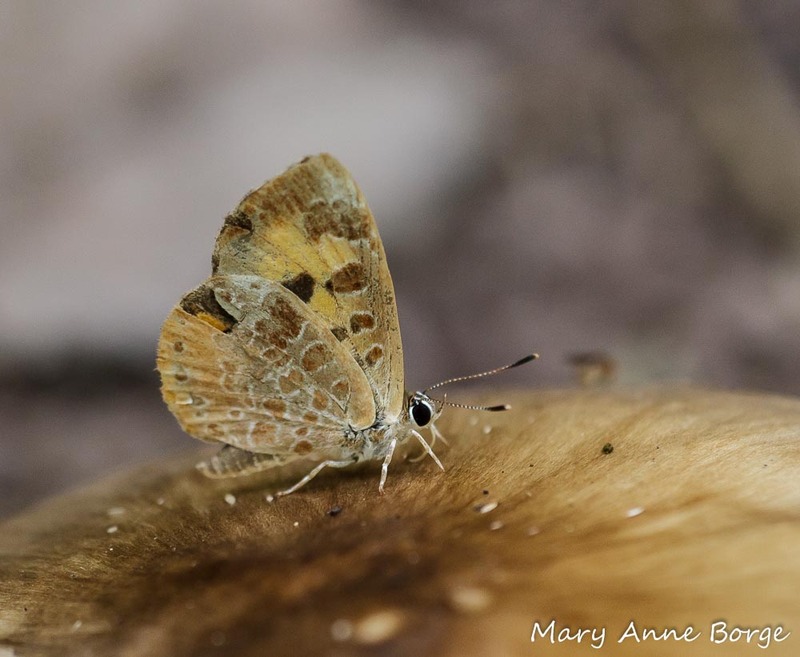 One species that has more unusual eating habits is the Harvester (Feniseca tarquinius). 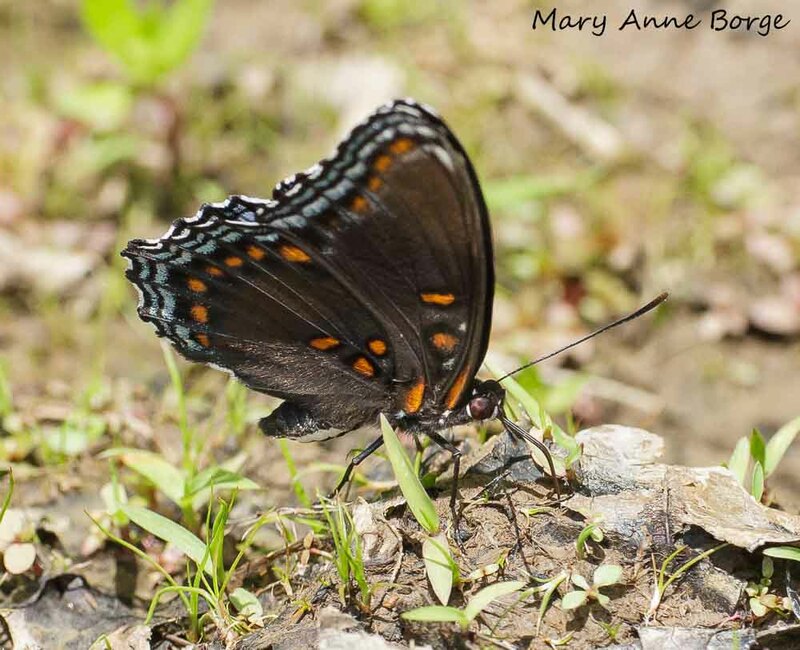 This butterfly rejects flower nectar in favor of honeydew, the sugary secretion produced by aphids. Harvesters also feed on mineral sources such as dung, sap and mud. 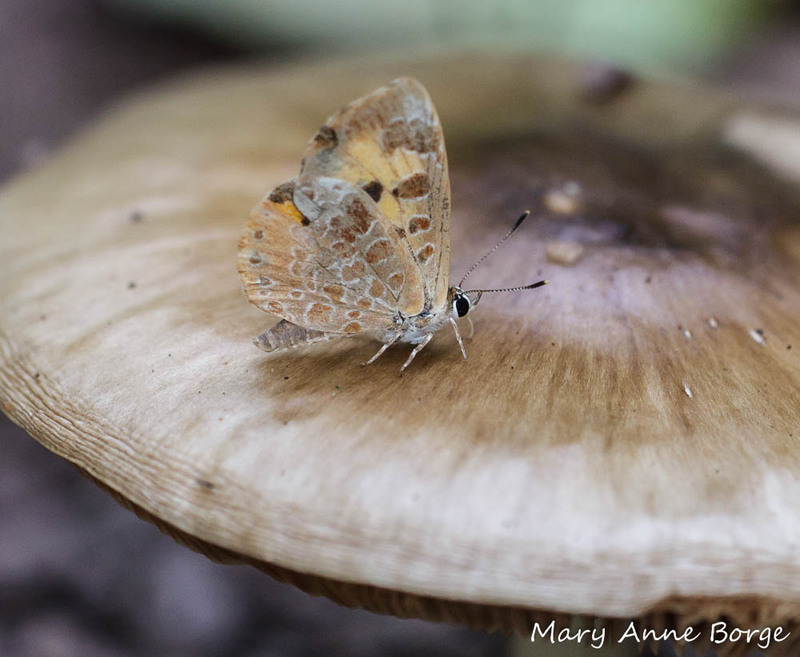 In the photo below, the butterfly is feeding on a mushroom. The Harvester’s eating habits explain its habitat preference, wet woodlands or along streams, especially where alders are found. Alders are hosts to the Woolly Alder Aphid (Prociphilus tessellatus), a favorite honeydew source for Harvesters. Even more important for the Harvester, these aphids are a favorite diet source of its caterpillars. 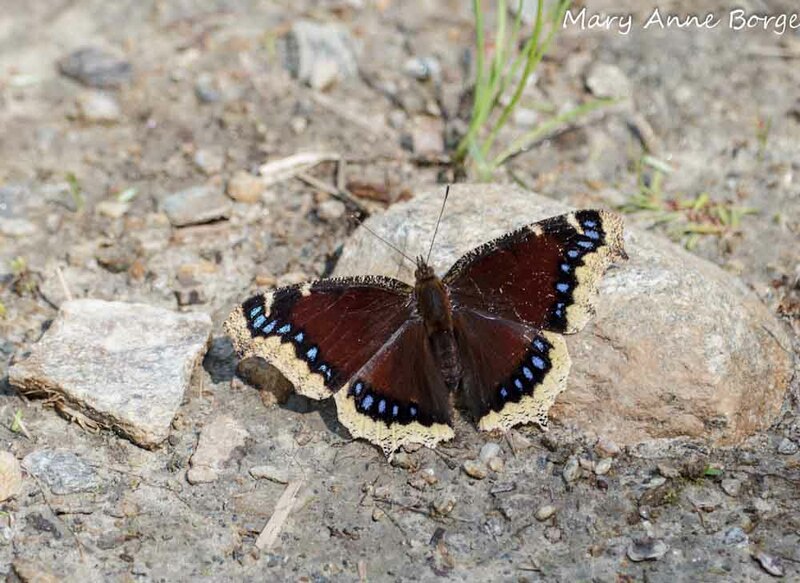 The Harvester is the only butterfly species in North America whose caterpillars are strictly carnivorous. 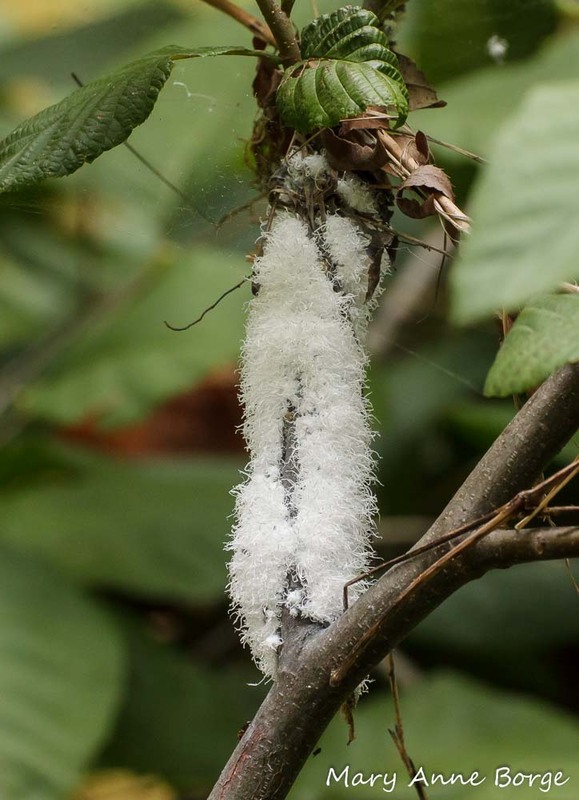 They feed primarily on several species of woolly aphids, often the Woolly Alder Aphid, but also the Woolly Beech Aphid, as well as others. 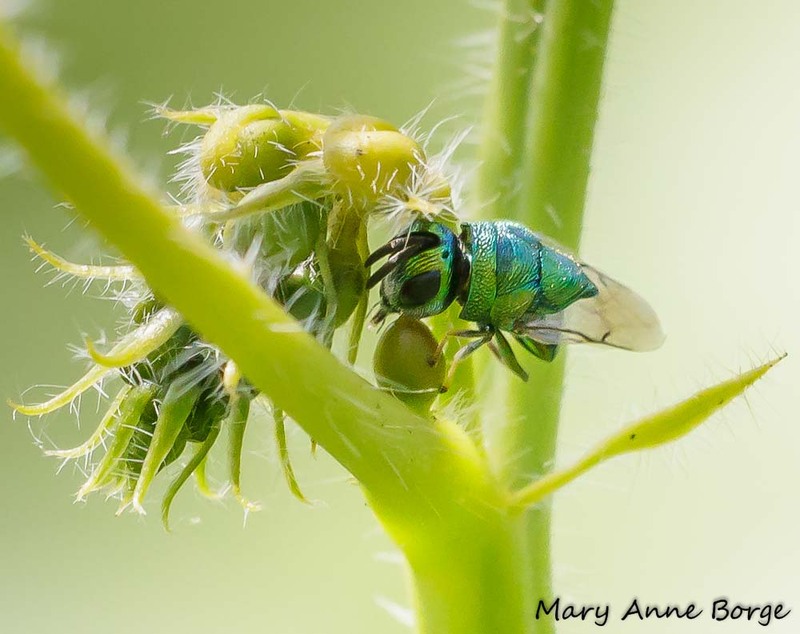 The caterpillars will sometimes disguise themselves from predators by using their silk to tie to their bodies the remains of the aphids they consume. This is especially effective as protection from ants that may be tending the aphids for their honeydew. 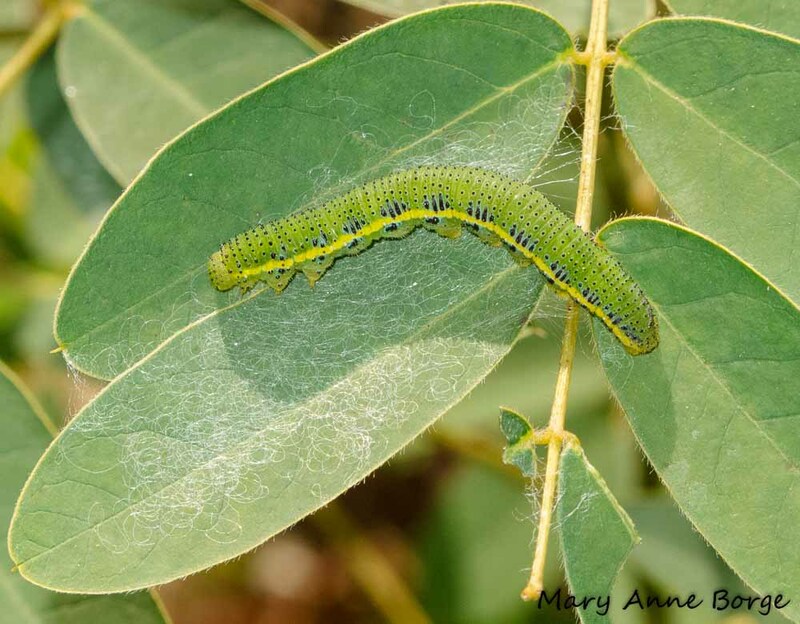 The Harvester caterpillars share some of the chemical signature of their aphid diet, which also may give them protection from predatory ants. 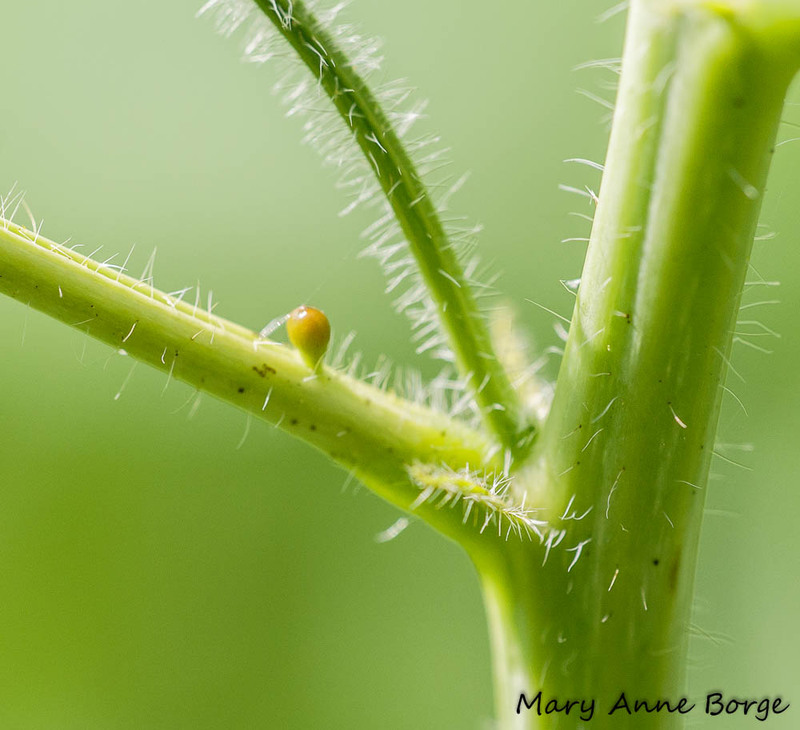 So wooly aphids feed both the Harvester butterfly and its caterpillars. Because of its habitat and food preferences, the Harvester is not commonly seen. So consider yourself lucky if you encounter one! Wild Senna’s petals are open and distinct. 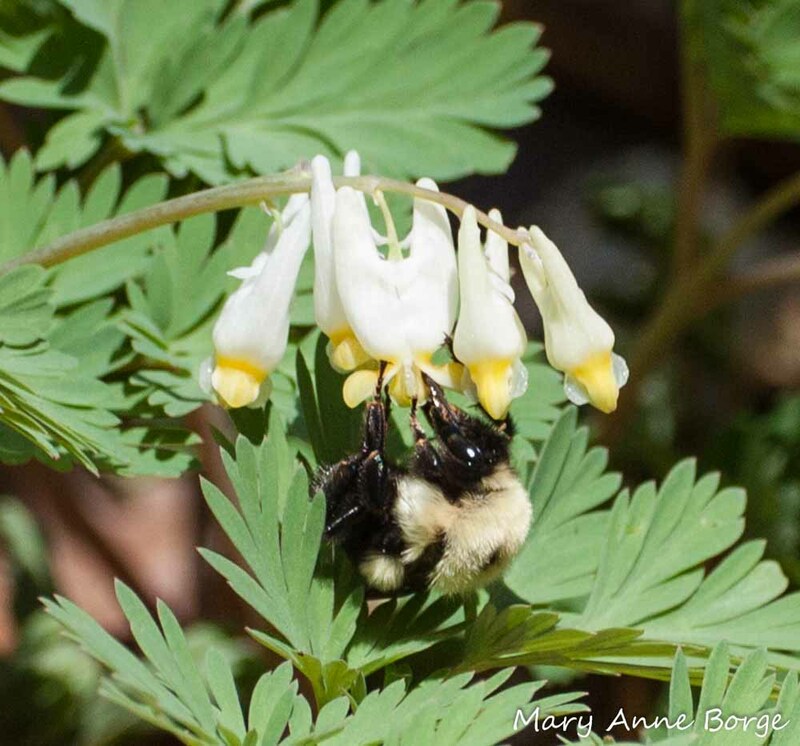 Wild Senna (Senna hebecarpa) with Bumble Bee. Note the pollen on her rear legs. Wild Senna’s flowers have another somewhat unusual feature, or more accurately, they lack a feature, nectaries, that many flowers have. Many plant species have evolved to entice pollinators to their flowers by providing a reward of nectar in exchange for their visits. 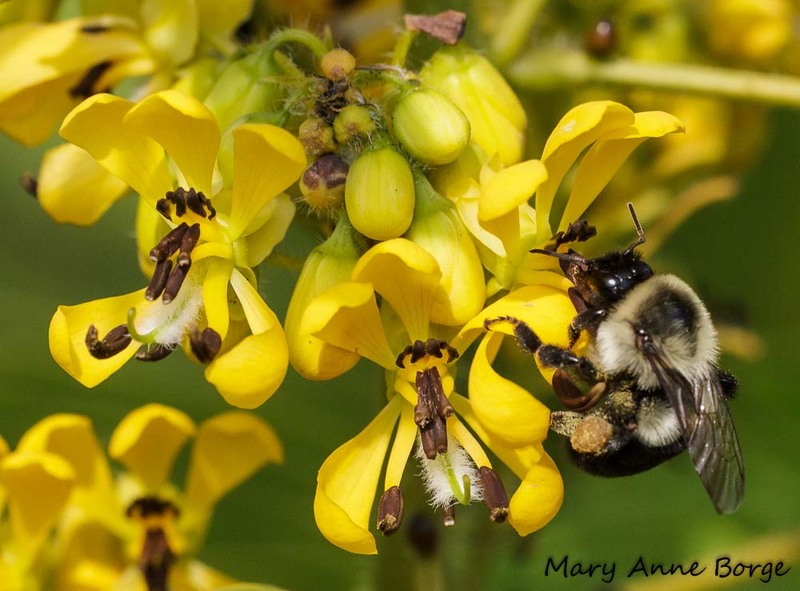 In spite of the lack of nectar, Wild Senna is pollinated by bees, primarily Bumble Bees but also Sweat Bees (Halictid species). They visit the flowers for their pollen, a highly nutritious food that contains protein, carbohydrates, fats, vitamins and minerals; plenty of incentive for a bee to visit even without nectar. Alerted to the possibility of food by the colorful yellow flowers, the adult bees come to dine on pollen and to harvest some to bring back to their nests for their larvae. Many plant species have evolved to produce chemical compounds whose primary purpose is to protect the plant from being eaten by making it bitter, distasteful or even toxic to potential consumers. 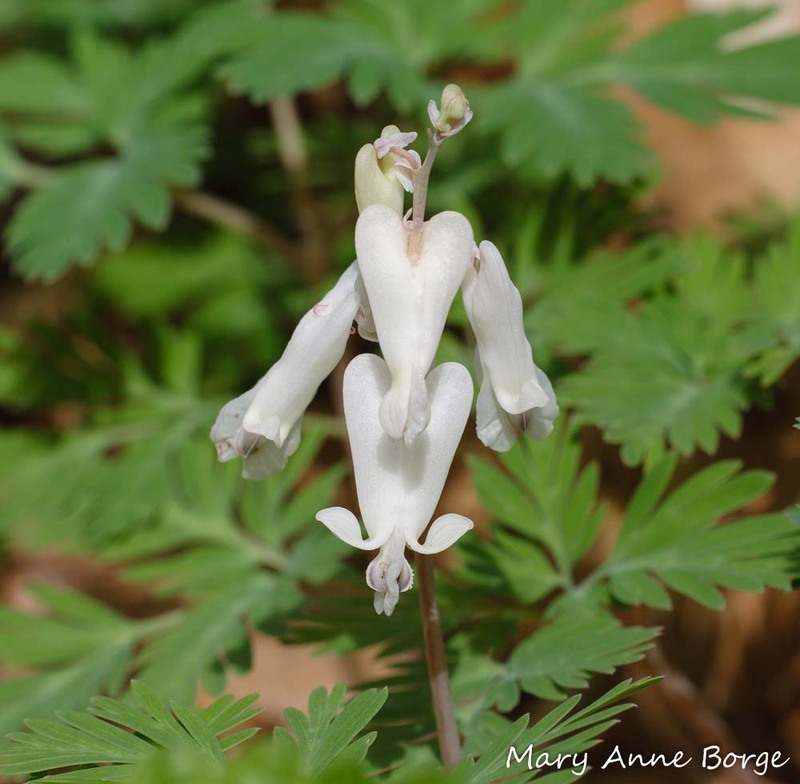 Wild Senna is a species that has adapted to use this defense. Both the leaves and fruits (seed pods) contain anthraquinones, which are powerful laxatives. Often people take advantage of the protective chemicals that plants produce by finding medicinal uses for them. In the case of the Senna species, the laxative is used for treating constipation. and the Common Tan Wave, whose caterpillars are able to eat the leaves or other parts of Wild Senna. These insects have evolved to specialize on these and other closely related plants, without being harmed by the chemicals that are toxic to other species. Which brings us to an interesting back-up strategy Wild Senna employs for protection. Wild Senna has extrafloral nectaries, a nectar source separate from the flowers. They are positioned on the leaf petioles (stems) near their attachment to the primary plant stem and adjacent to the flower buds. 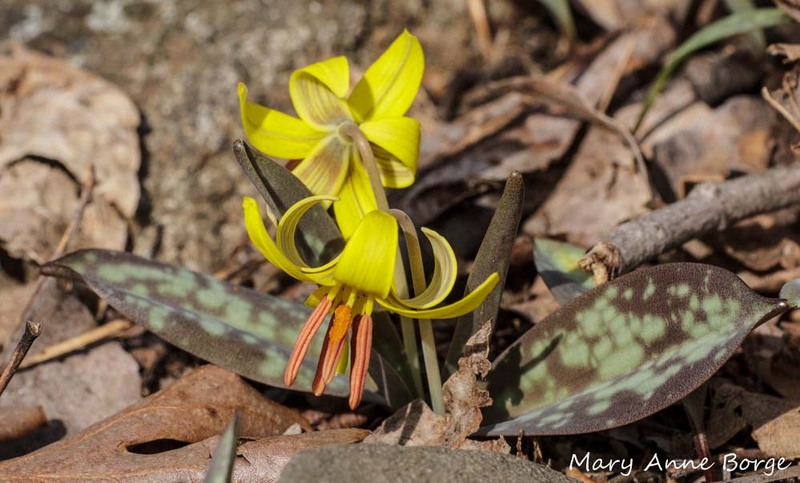 Why would a plant species offer nectar if it’s not a lure for pollinators? It takes energy and resources to produce nectar. What’s in it for the plant to provide this service? Who feeds here? 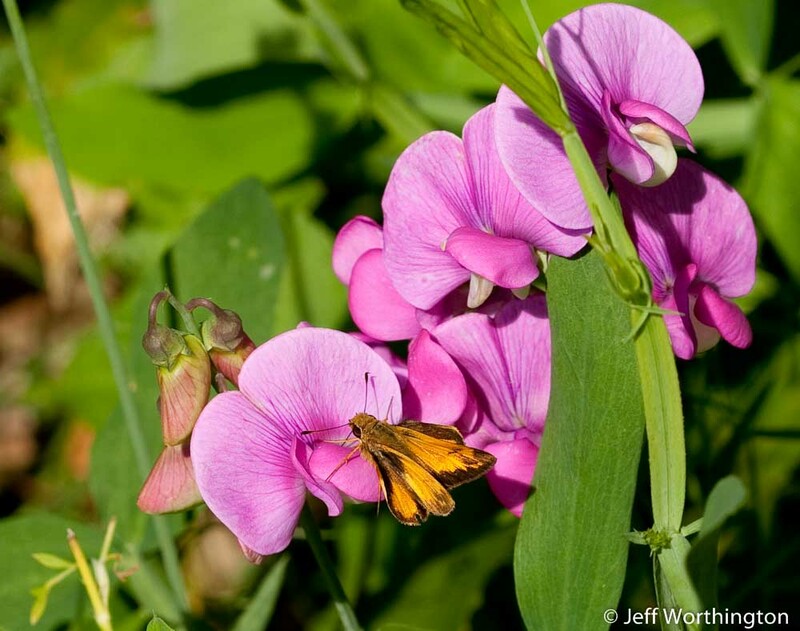 Wild Senna’s extrafloral nectaries attract a variety of visitors, many of them beneficial members of the ecosystem. 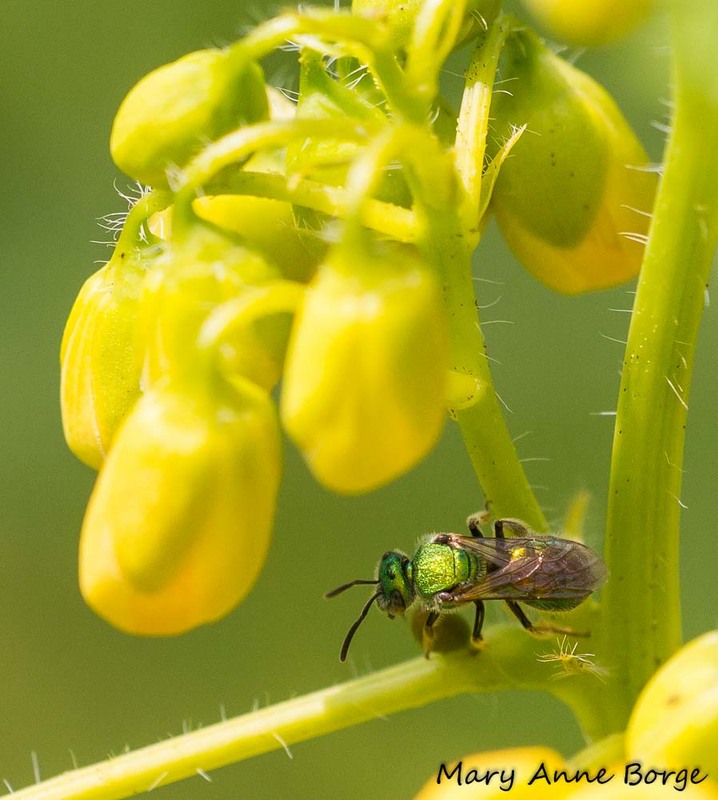 The Sweat Bee below may have stopped here before or after visiting Wild Senna flowers for their pollen. 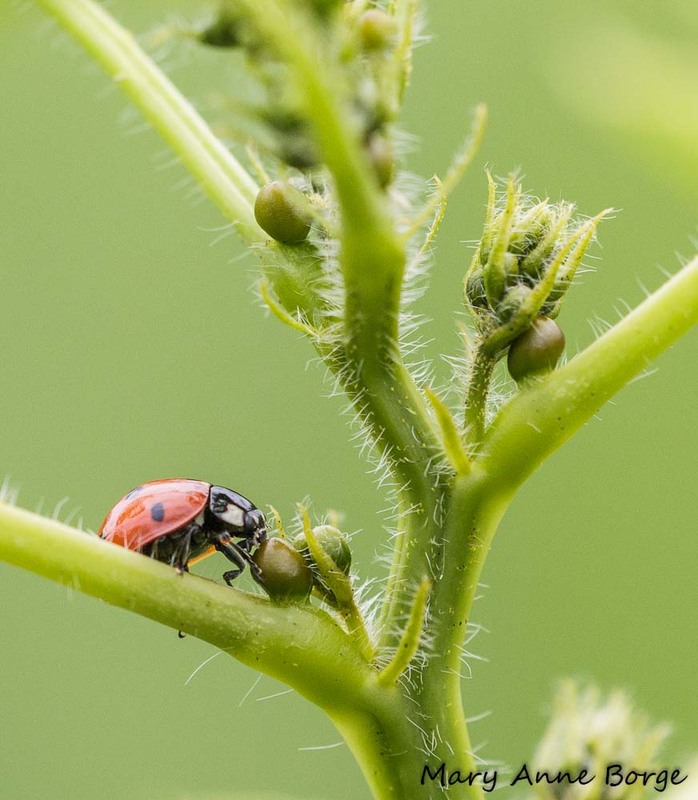 Many lady beetle species, including the Seven-spotted Lady Beetle pictured here, help to keep the aphid population in check. 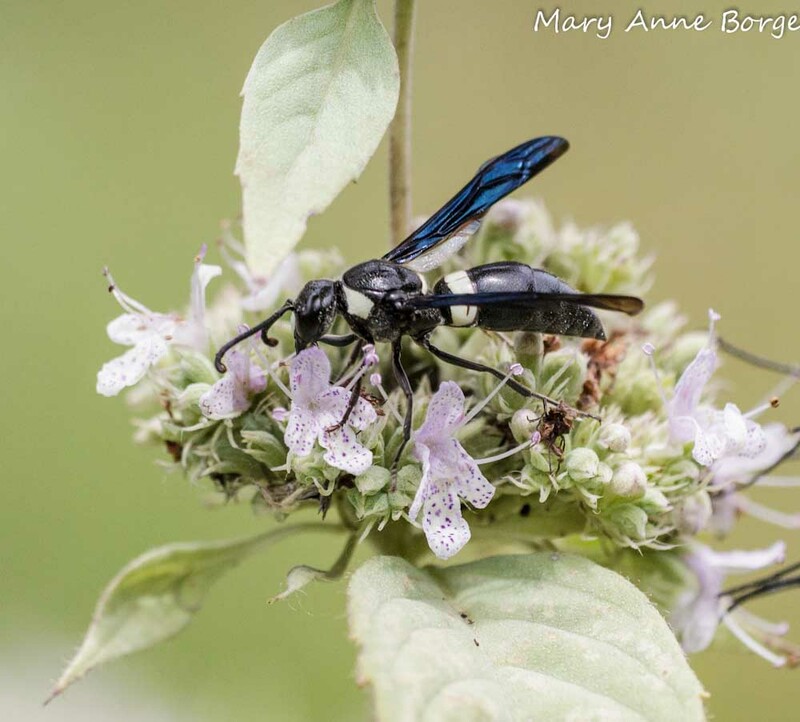 This jewel-like creature is a Perilampid wasp, one of several parasitic wasps that specialize on various insect species as their prey, including some other parasitites. For Wild Senna, ants are probably the most beneficial visitor to this nutritious food source. Sugary substances like nectar are important food for ants. But protein and other nutrients available from insects (including caterpillars) are also an essential part of the diet of most ant species. Ants that are enticed to visit Wild Senna for its nectar can also hunt for and eat the insects that may be consuming the leaves or buds of the plant. The placement of the nectaries between the leaf blade and flower buds is an advantageous location for protecting both plant parts. 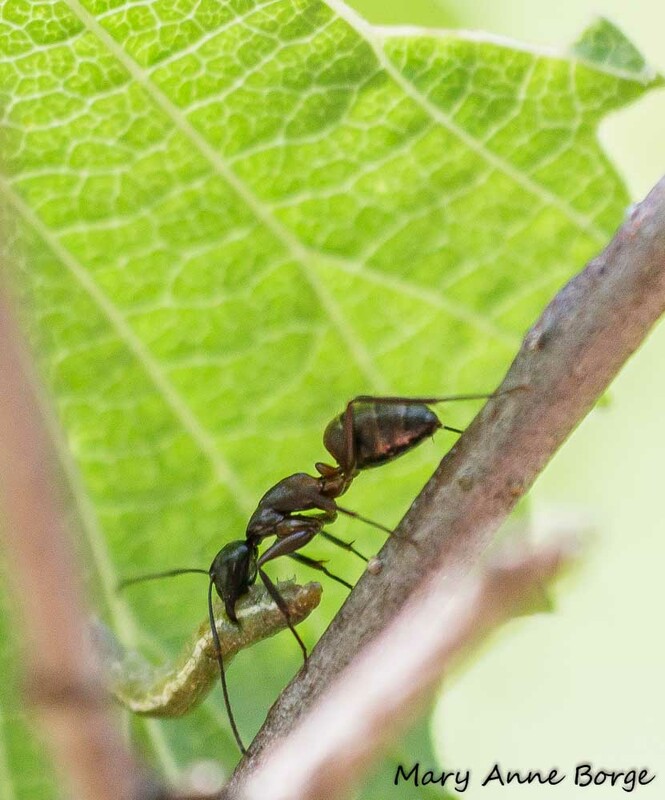 You might think of the ants as an army of mercenaries paid in nectar to guard the plant, with as many caterpillars and other herbivores as they can catch as a bonus. Ants will work for food! Marshall, Stephen A. Insects Their Natural History and Diversity. 2006. Waldbauer, Gilbert. What Good Are Bugs?. 2003. A Carpet of Spring Beauty, Woven by … Ants! 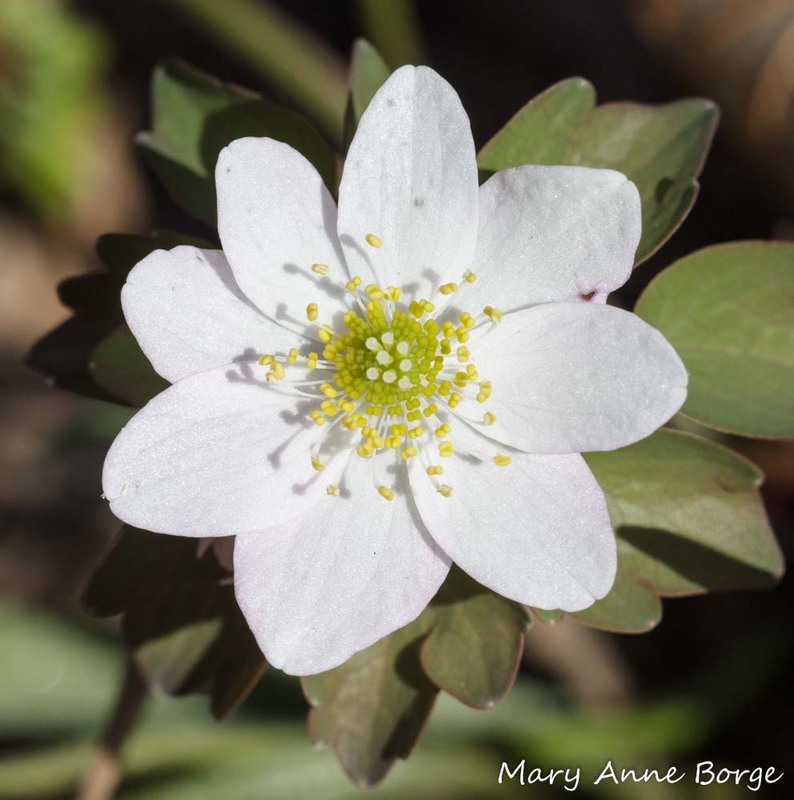 It’s breathtaking to watch the delicate spring wildflowers emerge from their blanket of leaves, bloom, develop and disperse fruit, all in a matter of a few short days or weeks. Although they look fragile, these are tenacious little plants, each focusing its efforts on perpetuating its species. 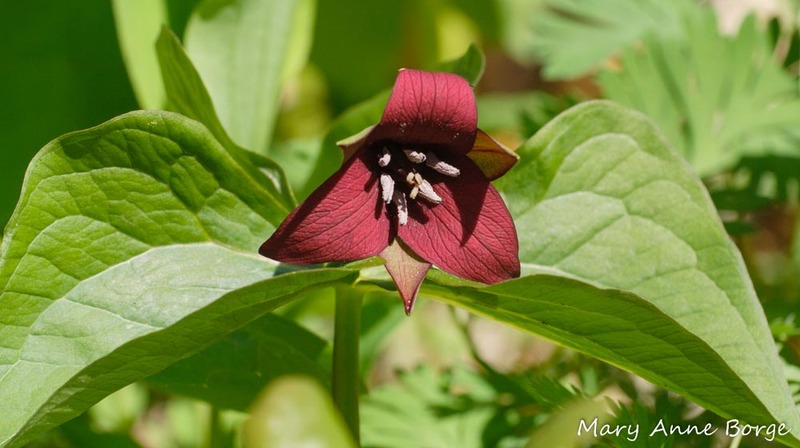 They have evolved to have a wide range of flower structures and colors, some with scents, enticing many different insect species to assist them in pollination. 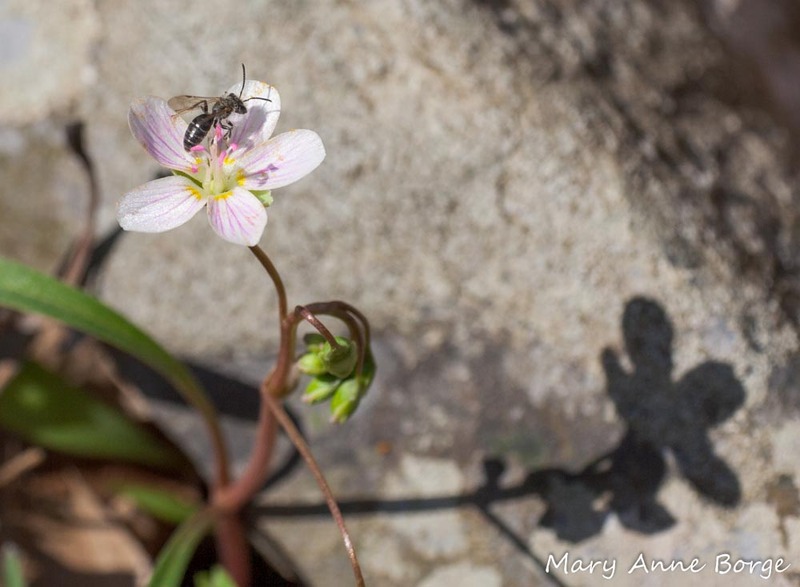 There is one strategy that a surprising number of spring blooming native plants have evolved in common: seed dispersal by ants. Many ant species are omnivorous, that is, they’ll eat both plant and animal matter. But given a choice, many ant species tend to prefer animals, often other insects. Early in the spring there are not as many animal food sources (insects) available as there will be as the growing season progresses, so the ants are more likely to make do with plant-based food at this time. 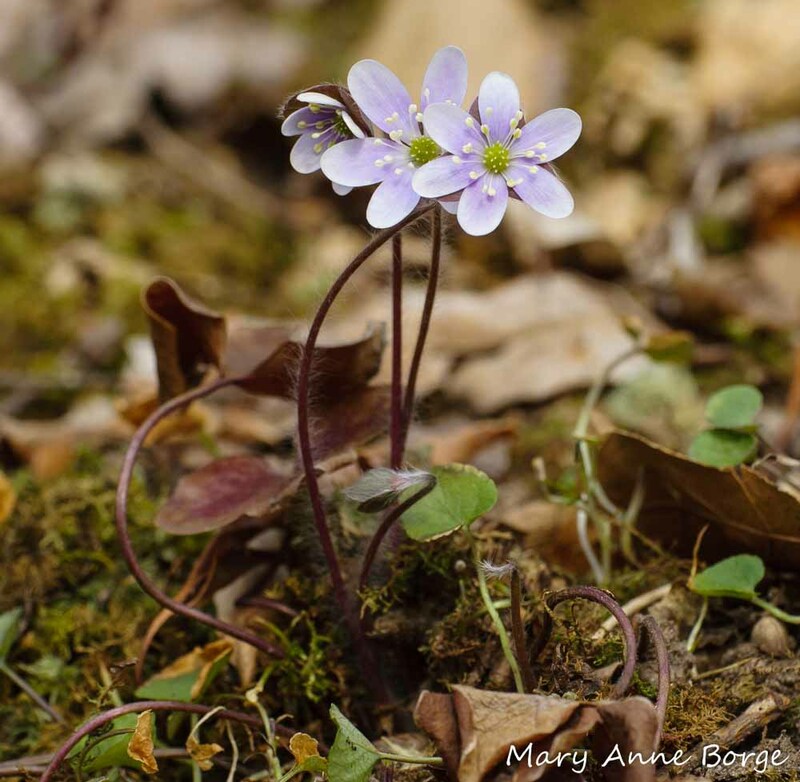 As many as thirty percent of the spring flowering herbaceous plant species in the forests of eastern North America have evolved to take advantage of this situation to benefit themselves. These species have evolved to provide food attached to their seeds to entice ants to disperse those seeds. This food, called an elaiosome, is a specialized fat body whose chemical composition more closely matches that of the insects that ants prefer than it does that of a seed. When a fruit opens to disperse its seeds, the elaiosomes are an instant attraction for ants. They take the seed with its attached elaiosome back to their nests for consumption there, but they just eat the elaiosome, their preferred food, and dispose of the seed on their trash pile. This tends to be an environment that is rich in nutrients, and will benefit the growth of the new plant. Just to make sure the ants don’t eat the seeds in addition to the elaiosome, some plant species have hard seed coatings that ants can’t really bite through. So this dispersal by ants, called myrmecochory, effectively plants the seeds. The new location is generally close enough to the parent plant to be a hospitable environment for growth, but far enough away to minimize competition for resources. It generally occurs within a very short time of the seeds becoming available. As a result, the seeds are protected from animals that might otherwise consume the them, which would give the seeds no chance to germinate and grow into a new plant. This evolutionary adaptation is somewhat analogous to the strategy of plants that have evolved to surround their seeds with fleshy fruits to attract birds to assist them with seed dispersal. 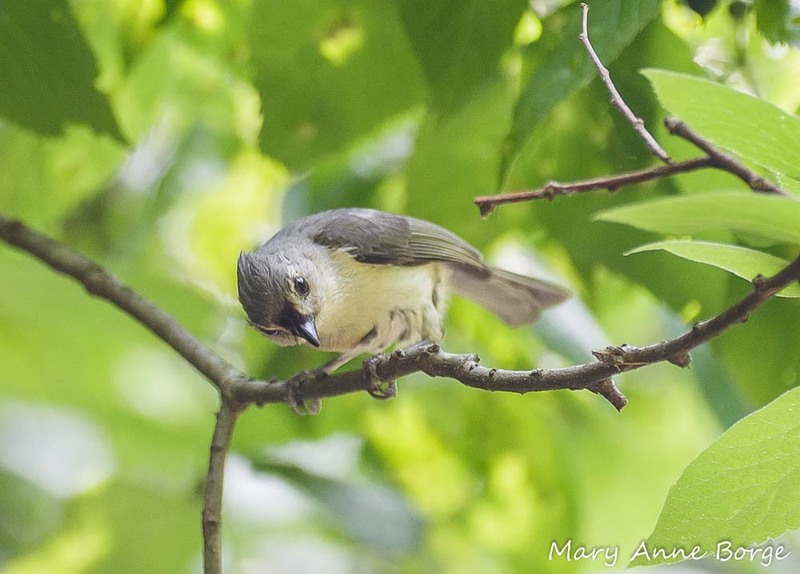 Given the fact that there are fewer birds available in early spring to help with seed dispersal, it makes sense that the early blooming plants evolved to partner instead with the ants for this service. 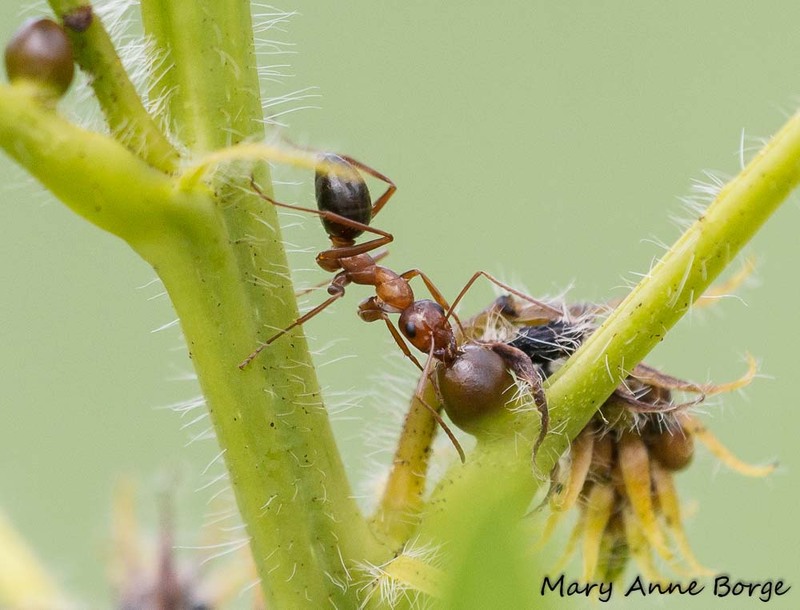 The plants featured in this post are just some of the species that share the evolutionary characteristic of seed dispersal by ants. 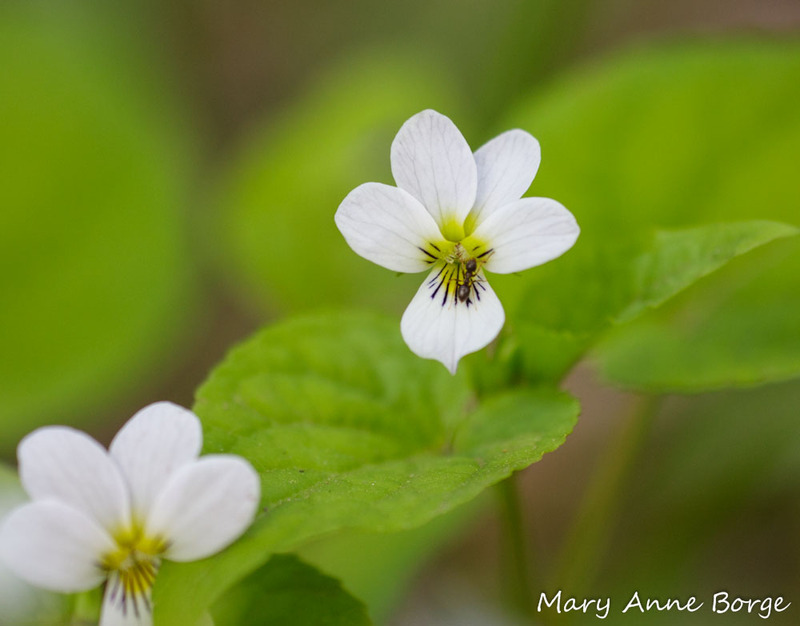 Did you ever wonder how your violets or Spring Beauty managed to pop up in new locations in your lawn or garden? Thank an ant! 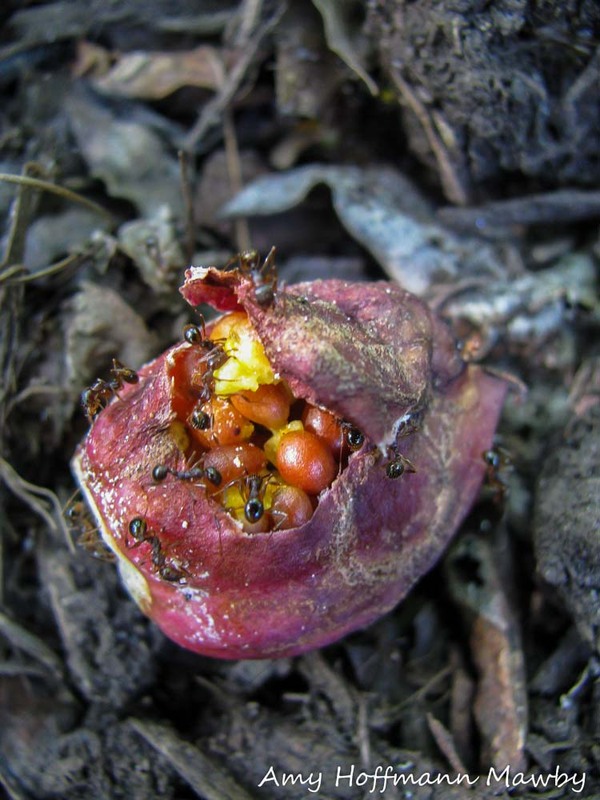 Special thanks to Amy Mawby for letting me use her photo of ants harvesting trillium seeds. Gracie, Carol. 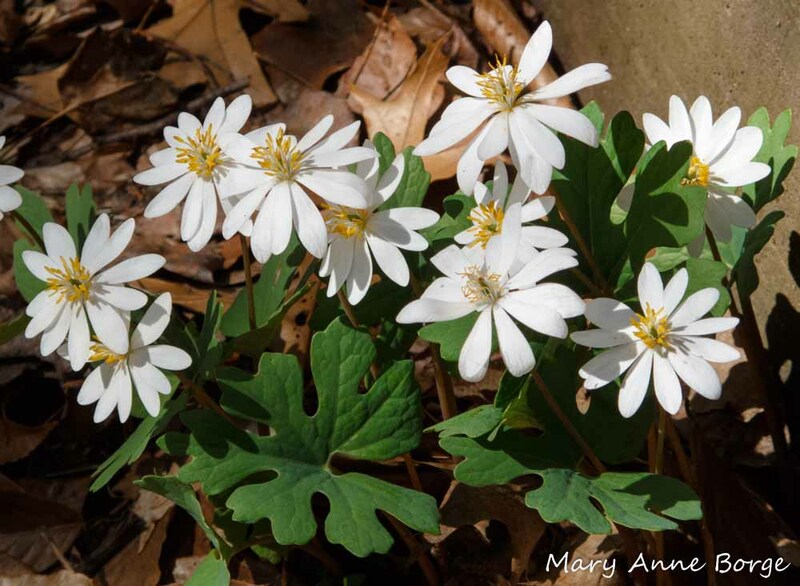 Spring Wildflowers of the Northeast. 2012. Rico-Gray, Victor; Oliveira. Paulo S. The Ecology and Evolution of Ant-Plant Interactions. 2007. Waldbauer, Gilbert. What Good Are Bugs? Insects in the Web of Life. 2003. ‘Getting rid of dead wood’ or ‘Cutting out the dead wood’ are phrases that are so commonly used that they have become ubiquitous when referring to a ‘reduction in force’ in the corporate world. These phrases have their origin in advice for maintaining landscaping. In a formal setting where neatness is desired, or where a dead tree or branch poses a threat to people, property or power lines (why don’t they bury those power lines, anyway? ), removing dead wood is certainly a prudent thing to do. But is ‘getting rid of dead wood’ always a good idea? Does dead wood have any function or benefit in a less formal or a natural setting? Well, let’s think about it. 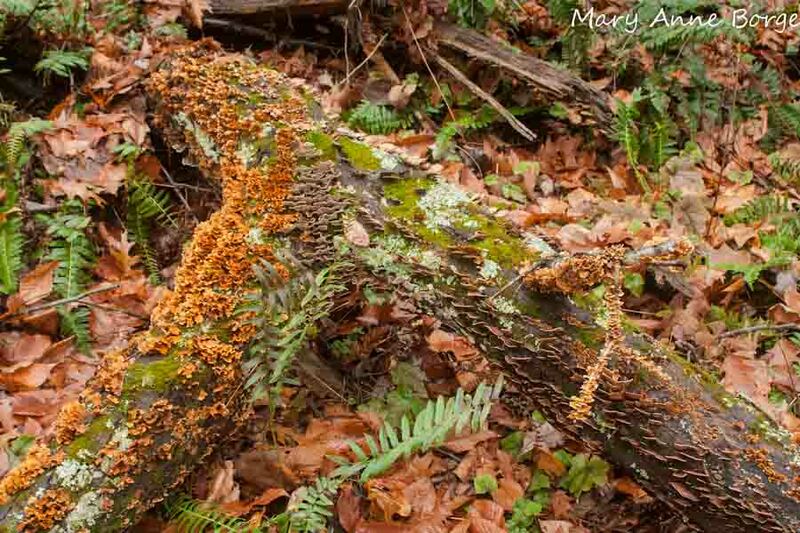 On the plus side, dead wood does provide a home for many species of fungi, some of which are eaten by insects, mammals (including people!) and other critters. 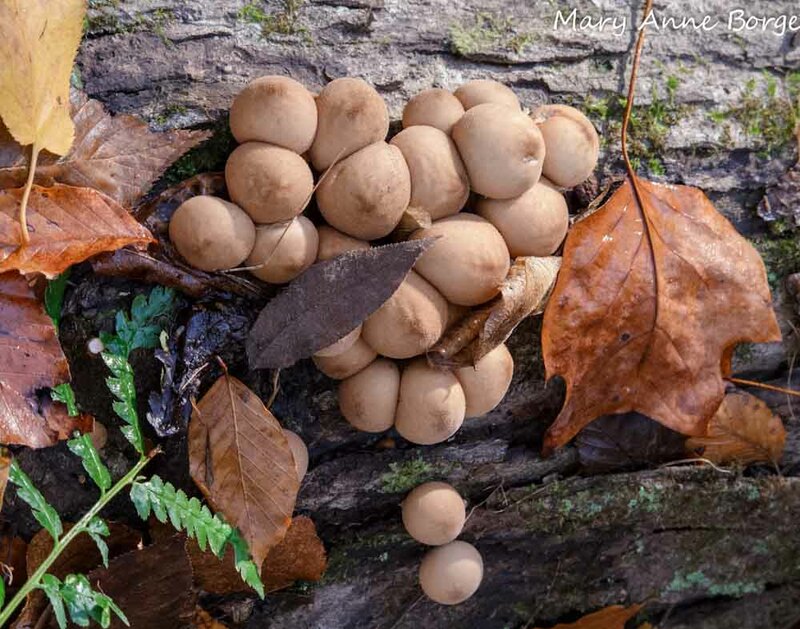 Some insects even develop inside mushrooms, like the puffballs pictured below. At first glance these snails seem to be using the mushrooms as a sun deck, but a closer look shows that they are feeding here. 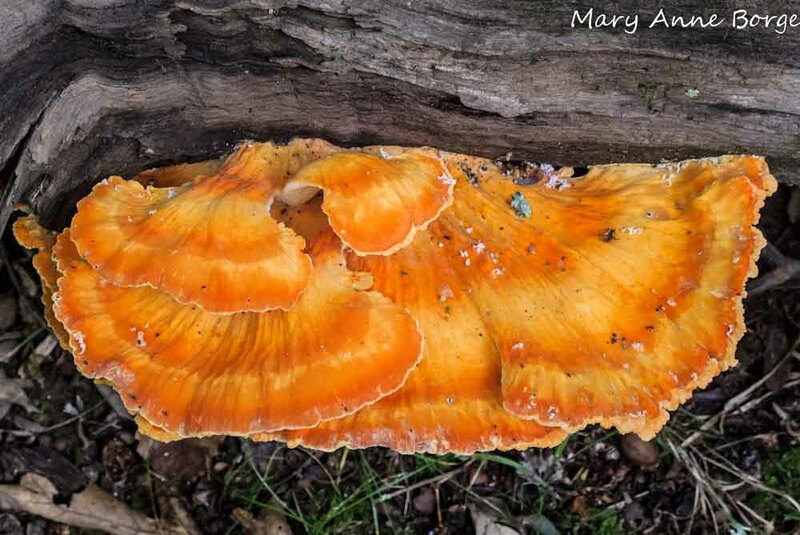 The young edges of the colorful Chicken of the Woods mushroom are edible, and taste like, well, chicken. 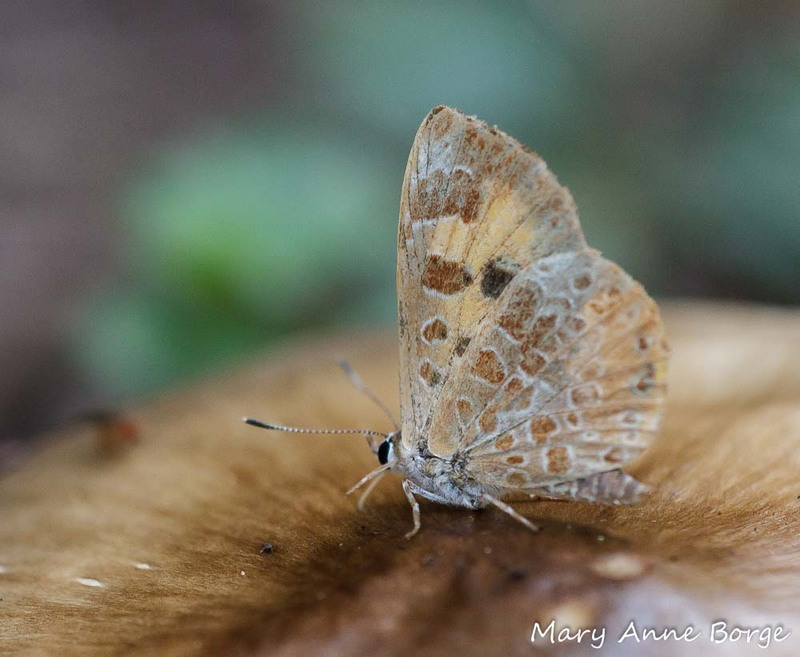 Many insect species, including ants, wasps, bees, beetles and even butterflies make dead wood their home for at least part of their life cycle. 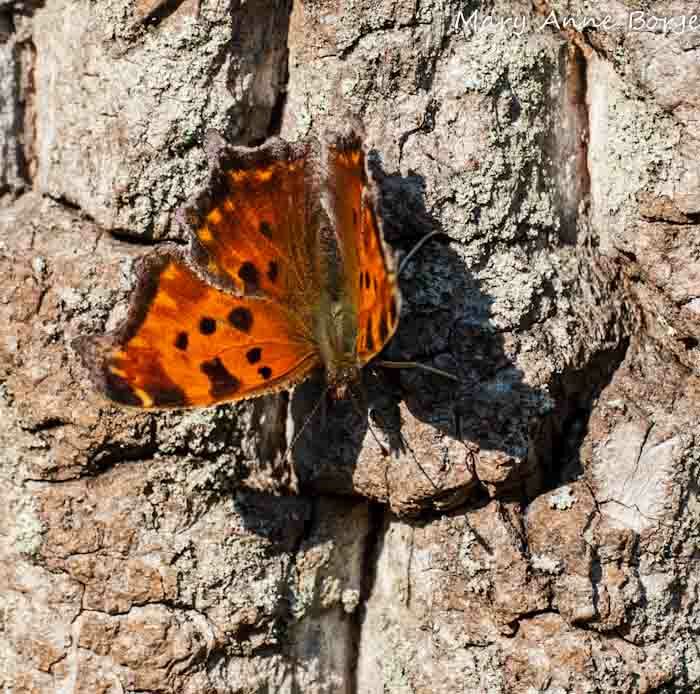 Eastern Commas, Question Marks and Mourning Cloaks survive the cold northern winter as adults, often taking shelter in a woodpile or underneath loose bark. Some species of solitary bees may make their nests in dead wood, like the sweat bee pictured below sipping nectar in the company of a Gray Hairstreak butterfly. This little sweat bee and other solitary bees are important pollinators, many providing free pollination services for food crops. Some of our native bees are more efficient pollinators than Honey Bees, because the native bees are a better anatomical match for the plants with which they evolved. Providing habitat for native bees can reduce the need to pay to truck in Honey Bees, the migrant workers of the insect world. It may also increase pollination rates and crop yield. Most wasps are predators of other insects, helping to keep their populations in balance. Mason wasps, for example, provision their nests with caterpillars on which their larvae feed as they develop. They usually nest in borings made in dead wood by other insects like beetles or bees. 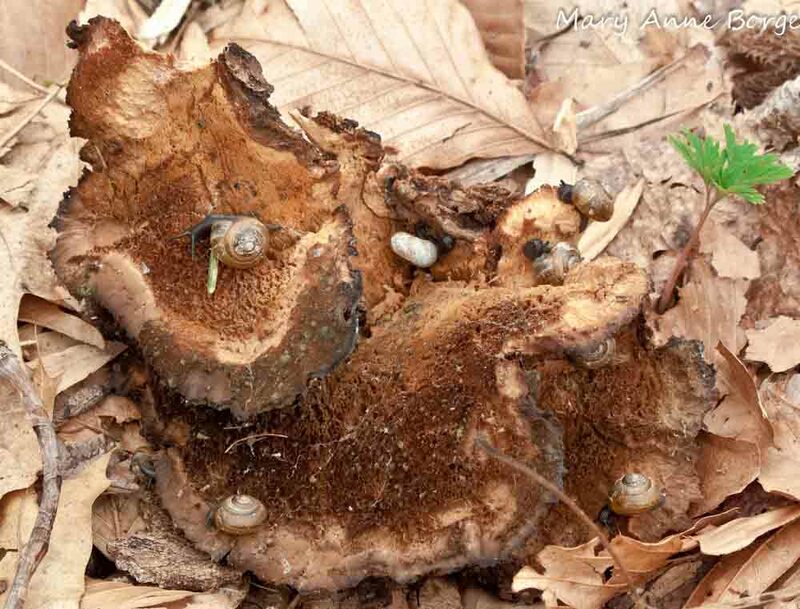 There are ant species that make their homes in rotting wood. Ants don’t cause wood to rot, and they don’t eat the wood. They excavate spaces for their nests in wood that is already soft, moist, and decaying. 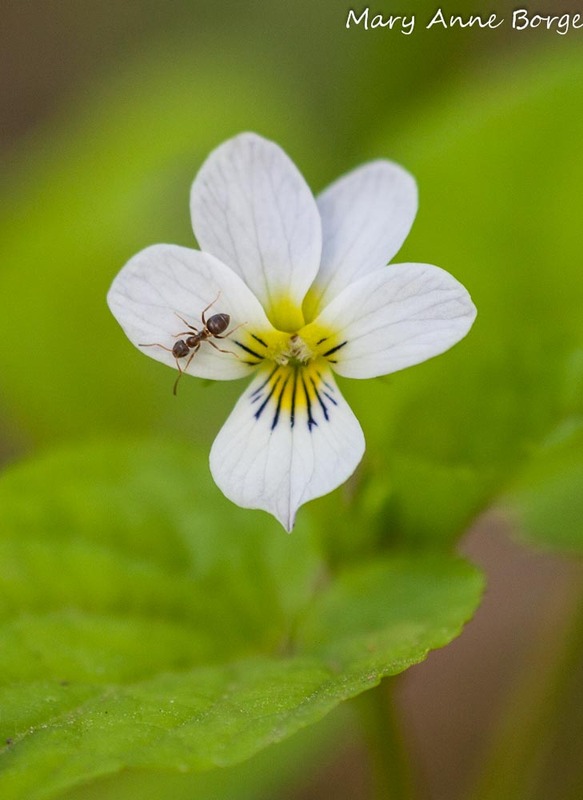 Ants are important seed dispersers for many plants, including violets, trilliums, Dutchman’s Breeches, Spring Beauty, and many more. Ants and wood boring beetle larvae are favorite foods of many woodpeckers. Among them are the largest woodpeckers in North America, the Pileated Woodpecker. 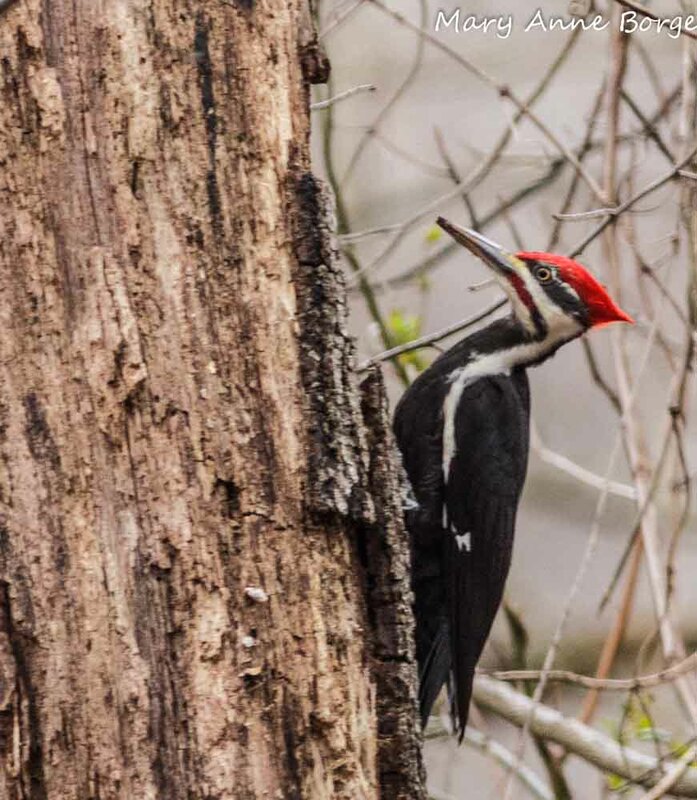 Have you have ever had a Pileated Woodpecker attack the siding of your home? If so, it’s because the bird has detected the presence of a delectable meal of carpenter ants there, which would only be present if you had rotting wood. So think of it as a free consultation, courtesy of nature, to let you know that you have some maintenance to do. Replace, paint or otherwise seal the wood to prevent moisture from getting in, and your problems with ants and woodpeckers will go away. They’ll go back to feeding on insects in the naturally rotting wood found in nature. In the photo below a Pileated Woodpecker is peeking out from his nest hole. 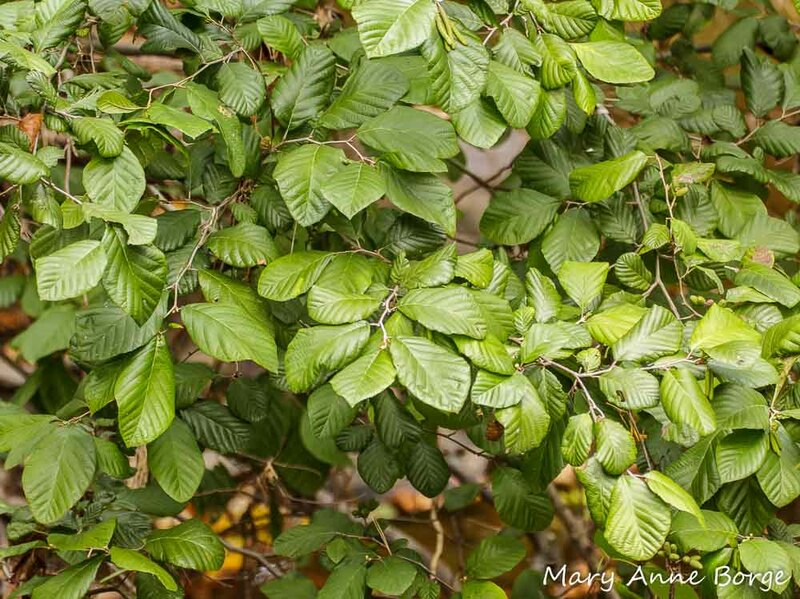 Can you tell what type of tree this is? If you said ‘dead’, you’re correct! 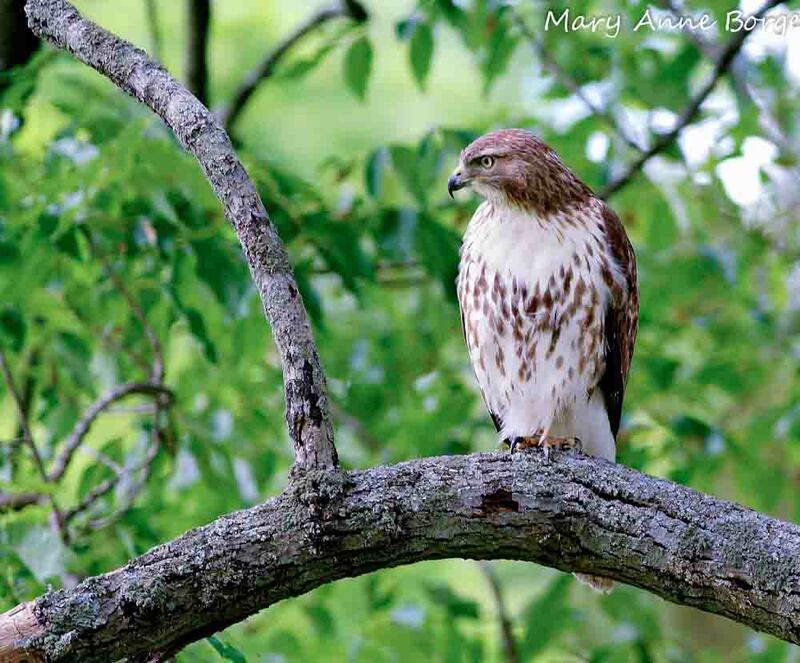 In addition to providing a bountiful source of insect protein, dead wood offers real estate for homes for many birds, including Downy, Hairy, and Red-bellied Woodpeckers, and Flickers. 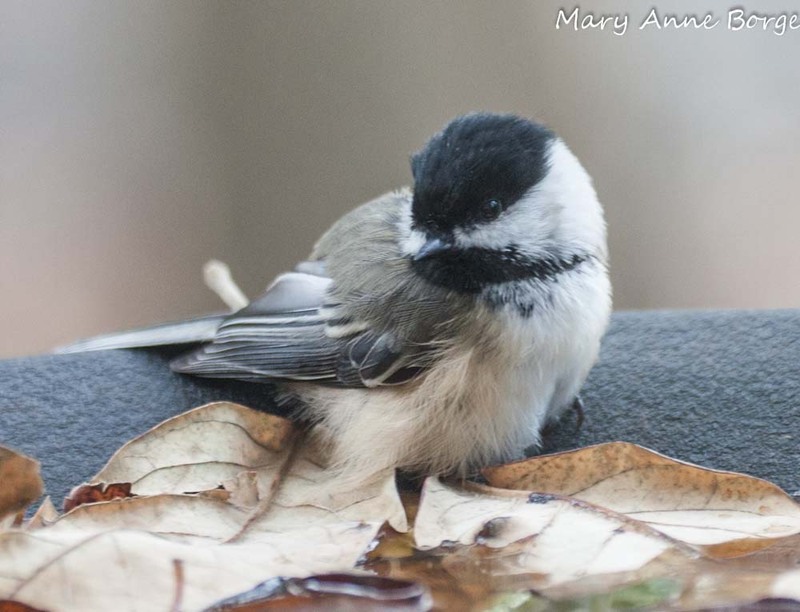 Even Chickadees excavate holes in very soft, rotting wood for their nests. 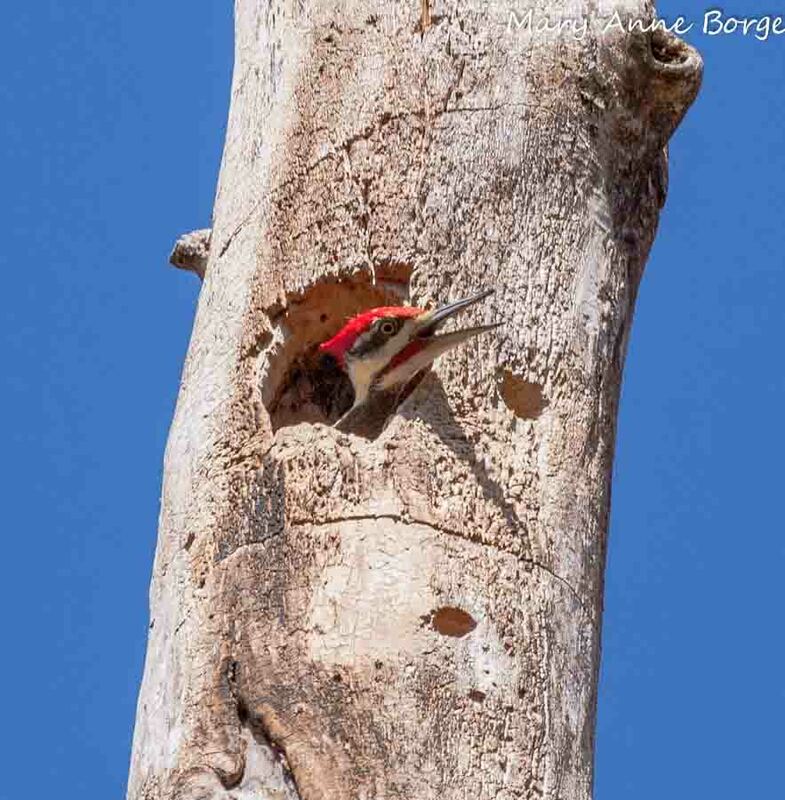 Titmice, White- and Red-breasted Nuthatches, Carolina and House Wrens all nest in holes in dead or living trees, sometimes using abandoned woodpecker holes. All of these birds also forage for insect protein, a bounty of which is available in or on dead wood. 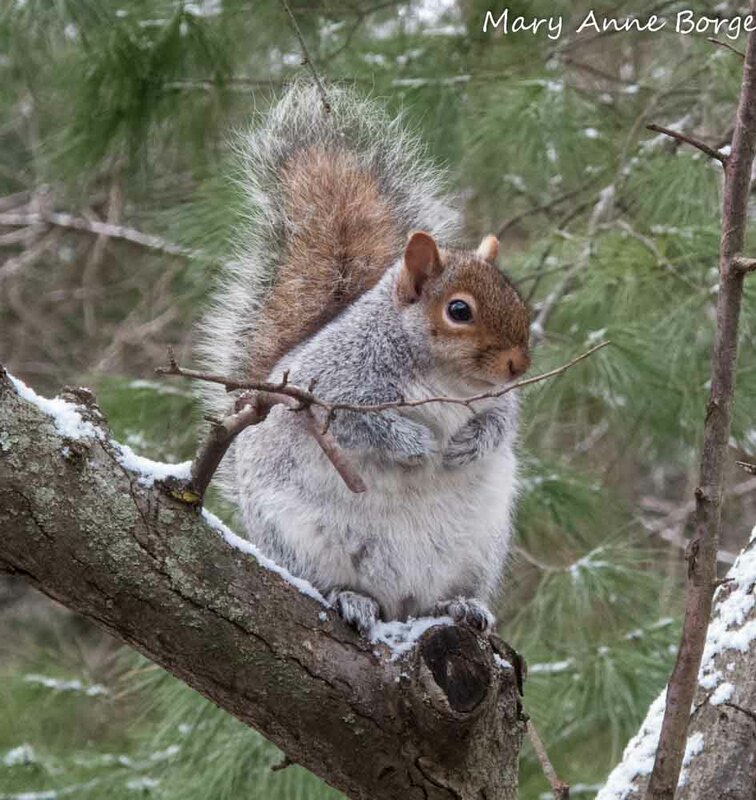 Eastern Gray Squirrels are among the small mammals that may make their homes in hollows in dead or living wood. Their diet depends heavily on tree nuts, but it also includes insects and fungi, as does that of Eastern Chipmunks. 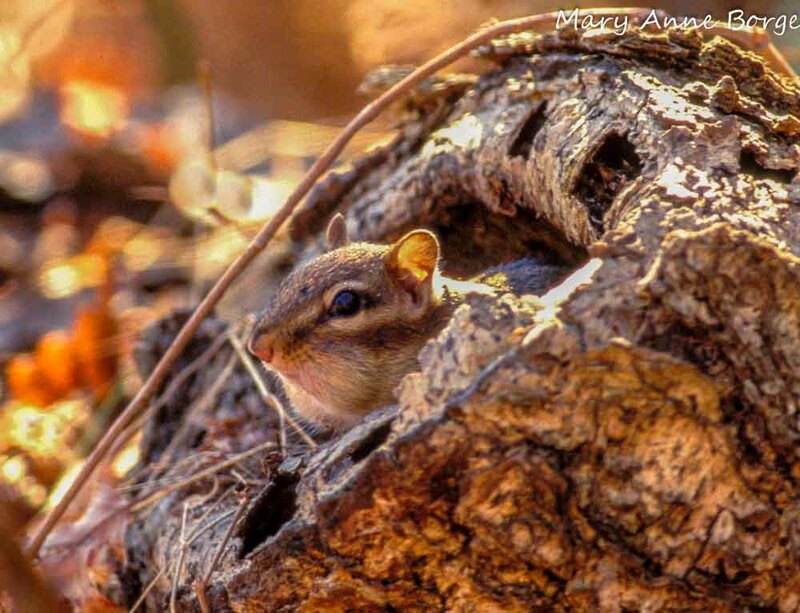 Chipmunks often dig underground burrows, but they also use tree cavities for shelter. 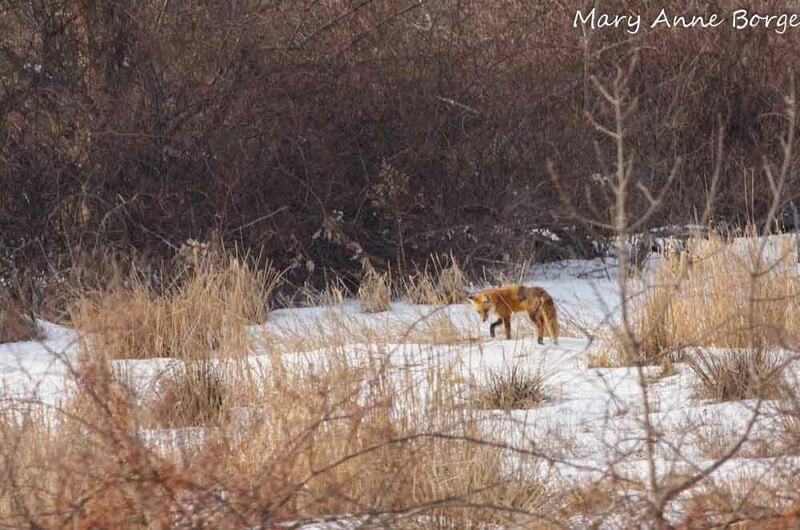 Larger mammals, like Red Fox or even Black Bear may use fallen or hollowed out trees as a shelter. … or a Great Horned Owl. 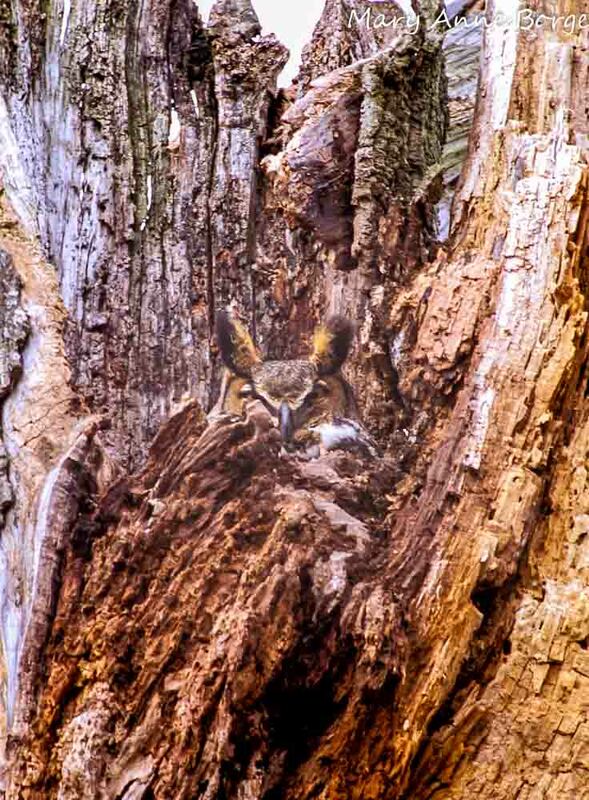 Dead broken trees, called snags, are a favorite nesting place for these large predators. All of this activity contributes to the breakdown and decomposition of the wood, which provides valuable nutrients to the soil. This makes a new generation of plants possible, keeping the cycle of life going. Dead wood provides shelter and food for insects and other arthropods, birds, and large and small mammals, including people. With the assistance of all of the inhabitants who avail themselves of these services, dead wood gradually breaks down, enhancing the soil for a new generation of plants. 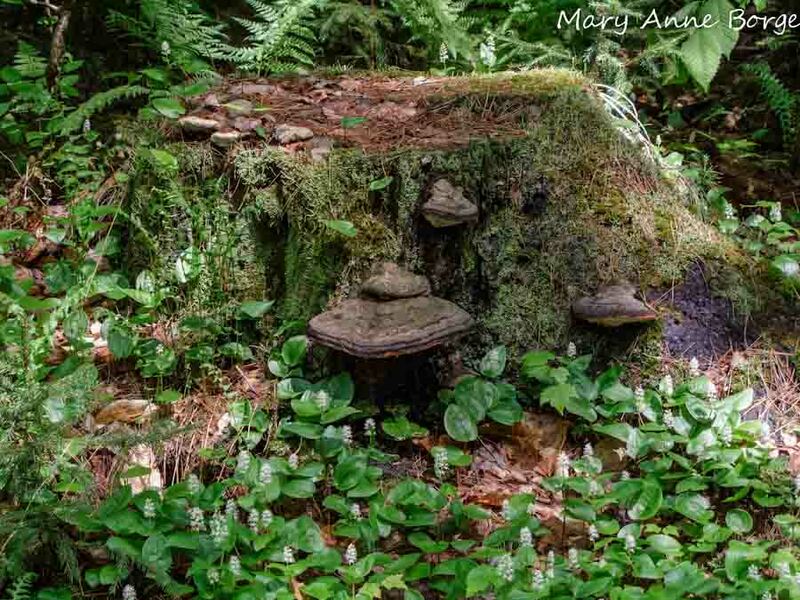 Dead wood also helps to divert and slow the flow of water in heavy rainstorms, allowing the water to slowly penetrate into the soil where it falls, rather than rapidly running off into creeks, rivers, streams and storm sewer systems, contributing to flash flooding along the way. So, what do you think, should we ‘get rid of the dead wood’? Elbroch, Mark; Rinehart, Kurt. Behavior of North American Mammals. 2011. Mader, Eric; Shepherd, Matthew; Vaughan, Mace; Black, Scott Hoffman; LeBuhn, Gretchen. 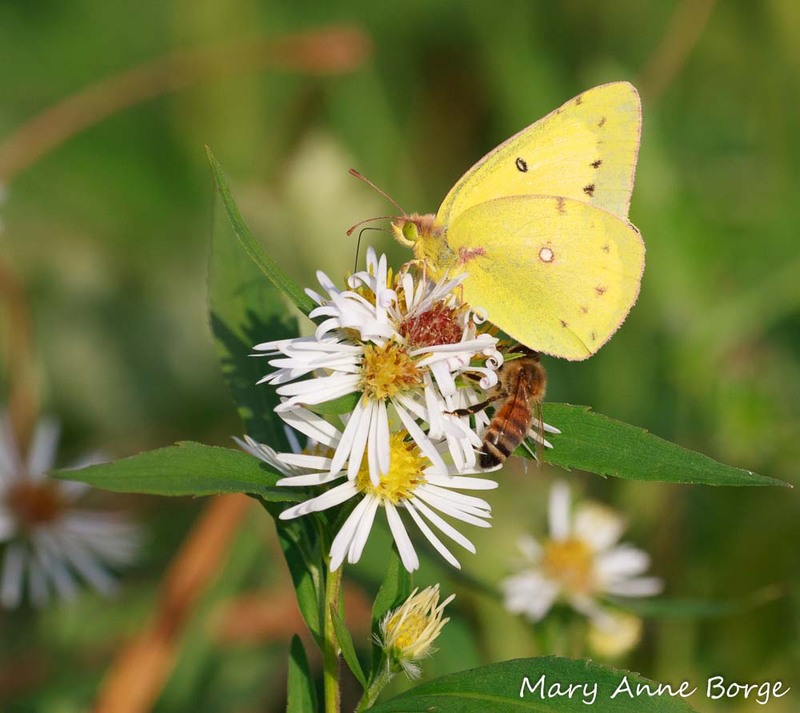 Attracting Native Pollinators: Protecting North America’s Bees and Butterflies. 2011.